Platinum-Cured; Polyester Mesh Fabric; Smooth or Convoluted O.D. 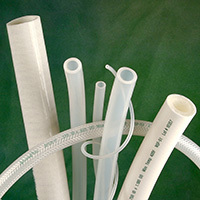 Low volatile grade, platinum-cured silicone hose for critical pharmaceutical, biopharm, cosmetic, and food applications comprises the liner of AdvantaSil® APSW. The liner is slipped onto a mandrel and wrapped with polyester mesh fabric, 316 stainless steel reinforcing wire and additional silicone. It is then cured into a homogeneous hose, enhancing its pressure and vacuum capabilities. AdvantaSil APSW has undergone extensive physical, chemical and biological testing and meets USP Class VI, FDA CFR 177.2600, ISO 10993 and European Pharmacopoeia 3.1.9 standards. AdvantaSil APSW is not intended for implantation and is not to be used for continuous steam applications. Available with a smooth O.D. or, for easier bending, convoluted O.D. Custom lengths and hose assemblies with an assortment of fittings are available.